The newspapers here have been full of the World Cup – the NZ Herald has even had a special section for the last 4 weeks called The Rugby Herald. The front pages of all papers have been dominated by RWC matters, Dan Carter’s groin, referee’s decisions, Tindall’s kisses, England party boys, oh and some rugby too! Today for example the main part of the NZ Herald has pages 1 – 5 dedicated to the RWC and then 10 pages of the Rugby Herald. There are 6 pages of National news, 5 pages of World news, 2 pages of other sports news, and 4 pages of Business news! I think this illustrates very clearly what makes the average Kiwi tick! Lost in amongst these very important news stories this week is one of the biggest maritime ecological disasters to befall NZ in years. The Rena – a container ship has run aground on the well-known, well-documented and charted Astrolabe reef just a few kilometres off the Tauranga coast. The Rena has been stuck on the Astrolabe reef now for 12 days. So far it has leaked more than 350 tonnes of oil into the water and approximately 80 containers have fallen off the ship. Bad weather is threatening the clean up and the pumping of the remaining 1000 or so tonnes of oil still on the Rena, and there is a very real risk of the heavy swells shifting the ship off the reef and it breaking in half. Beautiful, golden beaches are thick with oil and thousands of volunteers are helping clean up. (I have volunteered but have not been called up yet!) Sea birds including rare Blue penguins and petrels are being washed up coated in oil and wildlife experts are working hard to rescue them. Many more are beyond help. It threatens to be the biggest ecological disaster to hit NZ and it clearly comes second to the rugby! I love this story, though – jackets for the Blue Penguins to keep them warm and stop them from preening their feathers and ingesting the deadly chemicals from the oil and the cleansing agent. 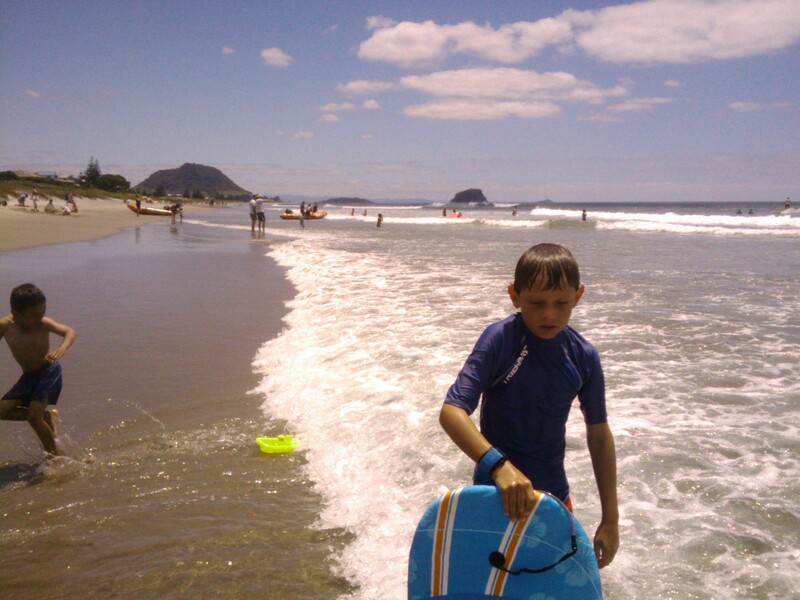 We don’t live far from Tauranga and head over there to swim and play in the surf reasonably regularly. The coastline is beautiful and the bay is also home to small islands, some of which are wildlife reserves. They are all threatened by the oil, the islands especially because they have rocky coastlines rather than the sand of the mainland and the oils gets under the rocks and is almost impossible to get rid off. We are watching the progress of the Rena closely and hoping that the oil can be pumped off before too much more of it escapes to damage the fragile maritime ecosystem. But, like the rest of the country I will come back to the rugby! Desolation for the Welsh on Saturday evening! The papers are full of the injustice of Warburton’s sending off. the negative way that the French played following it and the pluck of the Welsh for taking the game to the French! As far as NZ is concerned Wales won and France lost. They didn’t have many friends before the game and they have even fewer now! We sat in our living room like the rest of the country urging the Welsh on, hoping that their 14 men would overcome the 15 Frenchmen, and they so nearly did! There were thousands of Facebook comments on the RWC FB page all criticising the referee, the way the French played and extolling the virtues of the attacking Welsh. However, the simple fact remains that France did win and they will be playing the All Blacks next weekend in the RWC Final. And that is the delight in the title of this blog – delight that the ABs beat the Wallabies – not just beat them but annihilated them, and now all the hype is around what they can do to the French on Saturday night. Let’s just hope that they don’t choke on their dreams! Well, three long, long terms are over and we are ready for the break! Our strange term dates this year are entirely due to the Rugby World Cup which is now coming to a climax. The Final will be played on the penultimate day of the school Spring holidays, the last day being Labour Day – a national holiday in NZ so it will double either as a day of mourning here or a day of celebration! The injury smitten All Blacks are still in it, England have gone home in disgrace their tails between their legs, the Welsh dragon is still roaring and hoping to smite its Gallic cousins, and the Aussies – well they have hung on in there but everyone is hoping that they will be gone by Monday! We will be glued to the TV screen tonight and tomorrow and the Kiwis will either be crying in their beer on Monday morning or clinging to the dream. This little island at the bottom of the world is rugby mad and everyone wants a Welsh victory tonight so that they can avoid their nemesis, the French in the final. But what of the Welsh…? We went to watch two of their games in Hamilton, the first was against Samoa and the second against Fiji. 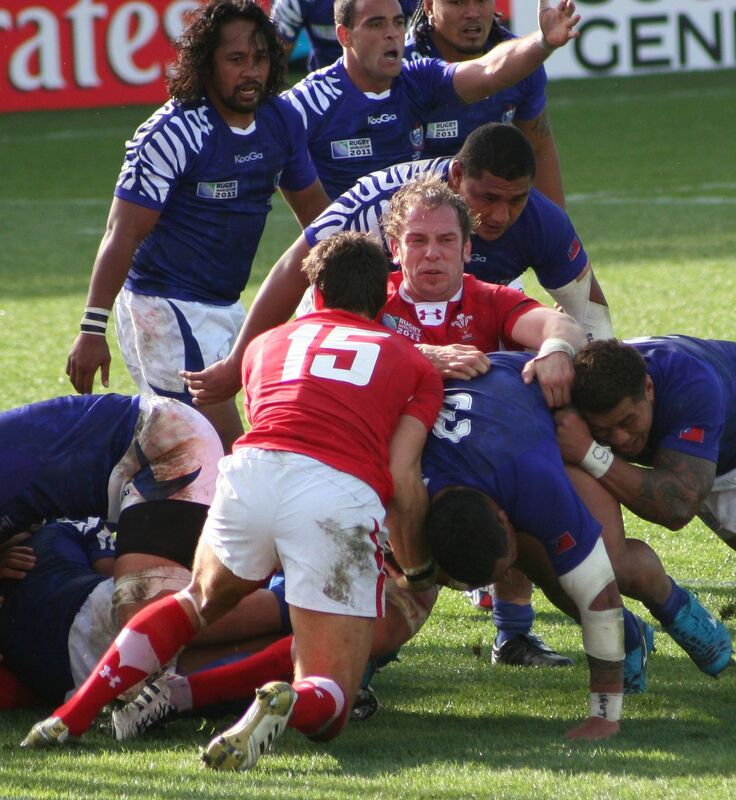 Samoa put up quite a fight and it was an exciting match to watch. We had standing space in the Green Zone – the cheapest tickets, but having kids means you can get to the front, so we were right on the try line in the corner so saw plenty of action. The atmosphere in the stadium was fantastic – a sea of colour – red, green, blue, yellow, and a cacophony of noise with the famed, but not always tuneful, singing of the Welsh and the enthusiastic chanting of the Samoans. We are not naturally inclined to support the Welsh (apologies to our good Welsh friends and acquaintances) as we have Scottish, Irish and English blood, and even a splash or two of French somewhere back on my maternal side, coursing through our veins. However, in the absence of any of these teams we found ourselves proudly singing along with the Welsh and chanting “Wales, Wales, Wales!” We sang (well laa’d) Land of My Fathers (as we don’t know the words) as loudly as the best of them – it was quite a moving experience! The Samoans performed their Haka which was equally impressive and certainly stilled the stadium for a few moments. End to end stuff, it would have kept us on the edges of our seats if we had had any, but we had plenty of opportunities for cheering and singing “Delilah”! No one seems to know why, but this World Cup we have the toreador’s “Ole” every time any points are scored – it certainly adds to the noise and everybody joins in! 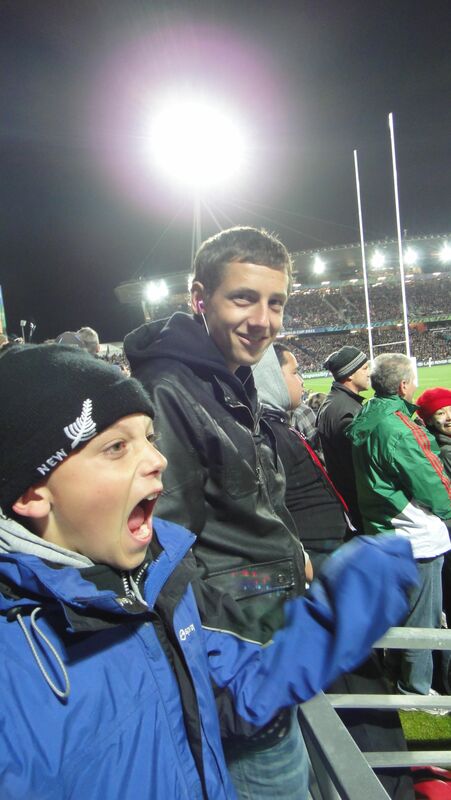 The atmosphere at the stadium at the match against Fiji was just as good although the match was more one-sided. I think most of the crowd would have liked to have seen Fiji score a try as they worked so hard for it and were so close to the line several times. 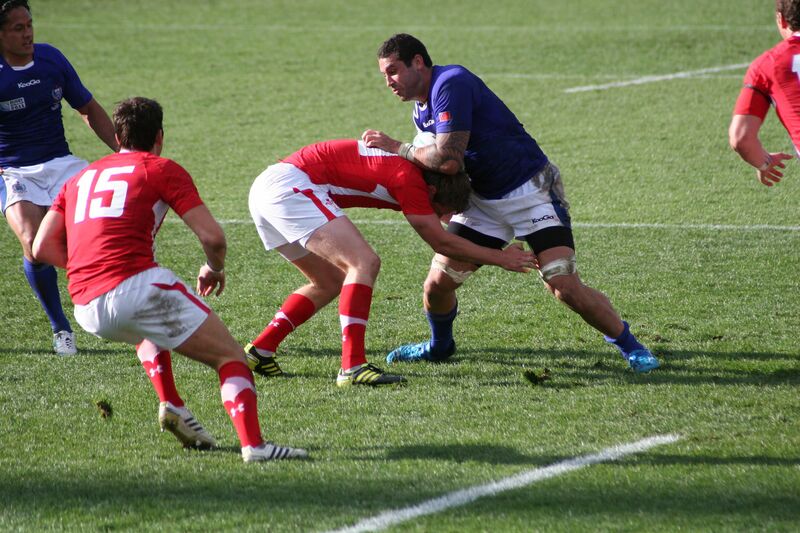 However, the Welsh kept them at bay with some great defending. In the end it was pretty much a whitewash – Wales certainly look good for the Final! We also went to see the ABs play Japan– that was a definite whitewash – but it was early on in the tournament and everyone just wanted to see the ABs off to a good start. There was a 2 minute silence at the beginning of the match to remember the devastation of the earthquakes suffered by both nations – for a short time the two teams joined in those sad memories. Then the battle lines were drawn as New Zealand performed their Haka and the Japanese stood resolute. Japan fought hard but they were no match for the mighty ABs and despite the whole crowd cheering Japan on every time they got close to the try line they failed to score until close to the end of the game. The crowd really did go wild!